Despite the dismal weather people turned out in their hundreds to take part in Day One of Chesterfield's Annual Arts and Market Festival. 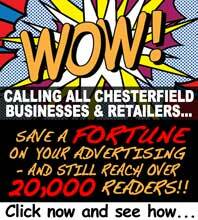 The four-day event, organised by Chesterfield Borough Council, will see a host of activities and concerts taking place at various locations around the town centre, including a Continental Market, dancing, beer festival and Festival of Light. Sean Carrington is Marketing and Promotions Officer for the Market and he explained the thinking behind the Festival, "The aim of the Market Festival is to show what the town has to offer and what we're about and how to pull everyone together. It's been popular today, although the weather has been a worry. It hasn't put people off though - we have a full market. "From today, the Winding Wheel the Church and Queen's Park (for the Festival of Light) are all venues for the event. Good time to have it at Half Term whilst there are lots of families around and one market stall trader has even come from London to take part." 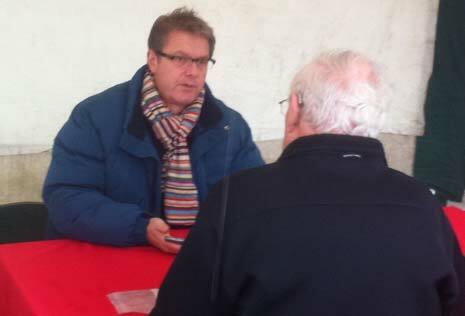 Yesterday's biggest draw was TV's Jonty Hearnden (above), from 'Cash in The Attic' who was once again in New Square valuing items brought by the public. He also set a challenge to the Mayoral Party and a team from Banner Jones Solicitors, giving them £100 cash, and asking them to buy items from the Flea market, which he would then assess for resaleable value. The team who had the capacity to make the most money back would win £100 for the charity of their choice. Some unusual goods were brought back including (from the Banner Jones' team) a set of weighing scales, brooches and a novelty teapot. 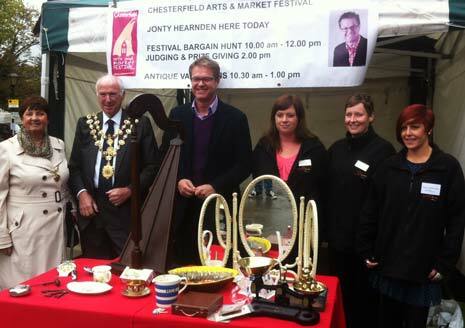 The Mayoral team bought a wooden harp, a set of car badges and a hip flask. After studying the haul, Jonty declared Banner Jones the winners - with the £100 going to Bluebell Wood. The team, comprising Dawn Mann, Anne Marie Lowe and Kerry Anderson told The Chesterfield Post that they had very much enjoyed taking part in the day, "We're delighted to have won! It was just a bit of fun, we didn't take it seriously and went for items we liked and thought would have value. It took us a while to spend the money and the stall holders were great - as soon as we said we were doing it for charity they helped us and we got some bargains. We don't know much about antiques and did some research by watching programmes but, in the end, we just bought what we liked." And the money they had won would go to a worthy cause which the firm is happy to support, "As a business we have done a lot for Bluebell. We had a charity ball for them earlier this year so it's nice to carry on the association." The Mayor, though on the losing team, was very happy to be involved and was looking forward to participating in many parts of the festival over the coming days, "It's very busy, every stall has gone and obviously word has got round that it's a popular event and, even though it's a horrible day, the turnout has been brilliant." "We went round with our £100 to find the different treasures. We saw things and then made our mind up to buy it, but when we went back they'd gone, so we had to start again. We used personal preference - if it appealed to us it may appeal to someone else. I spotted the harp and when we went back it was still there. It's all about raising money for the Mayor's Appeal, so it's a fun day at the end of the day. It was a democratic process choosing the goods!" It will be a varied few days for the Mayor, "We have the sausage competition tomorrow and we're leading the lantern parade into the park, so we're looking forward to that and also hoping to go to one of the concerts. It's a popular week and there's something for everyone." All the goods bought today by both teams will go back into auction to raise funds for the Mayor's Appeal. THE MAYOR AND THE ARMED FORCES. Chesterfield has very close links with all the Armed Forces and those ties remain something which the Town is immensely proud of.